No matter how many times I watch these photos, I still get psyched. My palms are sweeting so bad and the catalog is half wet already. Ahh…I sent 1 onsight and 1 red point this evening, with so many routes remaining failure, failure is always an option! I am also grateful to myself, my willingness makes me a better climber. Reunion II, Pitch 1, (6b) nothing, really terrible climb that I performed today. A 10 mins taxi ride from my home costed me 57…damn it…Before I met Polly I won’t care that much. Guess she really change me. Tonight is the boulder night and Theo is my company. There are several new routes which are quite chanllenging…I think I did 2 Red Point tonight. Not too bad compare to the past. Here is the last shot that I took with my A700 and 70-400G lens. 有時我阿媽會問, 駛唔駛整到專業攝影師咁. 其實係唔需要的, 但只係一種執著. 對美感的執著. And very sorry to Alejandro Morales who reminded to quote his name, of course thank you for your work!! Basically color management allows for a complete controlled color reproduction through the entire imaging workflow. In other words, the colors of your originals are maintained over the entire process of manipulation with a high accuracy percentage. There are two color management systems in SilverFast scan software, the one contained in SilverFast Ai and Ai Studio and the one found in SilverFast SE or SE Plus. This first article is dedicated exclusively to explaining the color management system in SilverFast Ai and Ai Studio. This big versions of the scanning software SilverFast have a very complete color management system which allow for a completely controlled scans in terms of color. The first section “Color management” lets you define how SilverFast will communicate with your different devices and which color profiles will be used for that task. 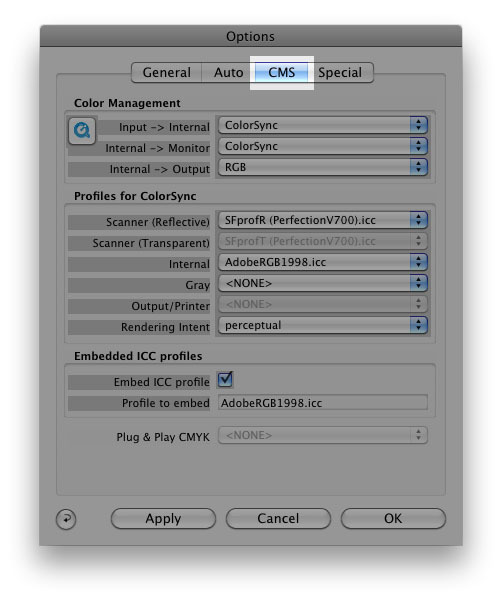 Input -> Internal menu specifies the color space system that will be used between your scanner and your program (either SilverFast or your post-processing applications). 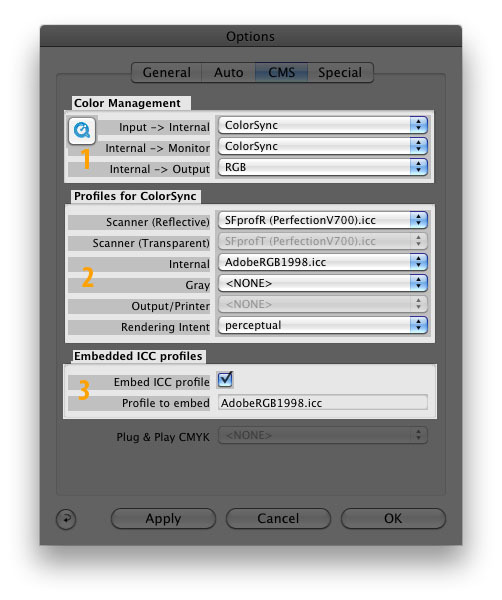 ColorSync for the Macintosh and ICM (image color matching) for windows. The option none is also present in case you want to give up color accuracy between your scanner and the programs. Input -> Monitor menu specifies the color space system that will be used between your program (SilverFast or editing application) and your computer monitor. Again, ColorSync for Mac and ICM for Windows. Automatic if photoshop should take care of how colors are presented by your monitor. This option is active only when starting SilverFast from within photoshop. RGB is recommended if the scanned images will be used for internet or other digital media like DVD’s, CD rom, etc. LAB CIE Lab represent all visible colors and is device or media independent, many colors contained within this color system can not be represented by normal computer monitors, most printers, paper, etc. This should be used by professionals and scientists who work and know how to interpret the values represented in this color space. P&P CMYK mode tells SilverFast to internally make the four color separation for printing. If you plan to make post processing in photoshop or any other external editor, you should make sure the same color space is active there, having different profiles ind both applications might lead to color discrepancies. The second section “Profiles for ColorSync / Profiles for ICM” will be explained in the following article.